Posts pertaining to the website, usually about design and feature updates. This post has 2,358 views. This is the first post in a while that is not about me visiting places and having fun. 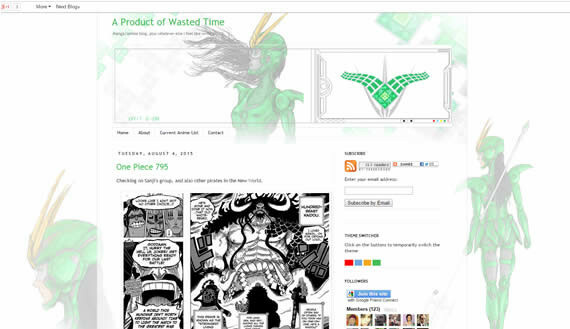 Up until yesterday, I had a blog called A Product of Wasted Time in which I wrote about anime and manga, and it was hosted on Blogger. That blog is now no longer exists because Blogger had recently received a number of DMCA complaints about my blog for copyright violations. Apparently just writing about particular anime episodes and manga chapters is infringement. I have never shared full episodes or chapters on my blog; I only write about the series I was following. At most, I had a couple of screenshots or one/two pages of a chapter included per post so I can put funny captions. But hey, I understand Blogger has the right to police their service, and I’m not mad about having the blog deleted. But still, R.I.P., A Product of Wasted Time. What my anime/manga blog looked like.